The images at the top or bottom of most of the webpages of my home pages are of vintage postcards from my personal collection. I have tried to match the subject of the card to the subject of the page. Here are descriptions of the postcards. They are listed in alphabetical order by the title of the page they appear on. "Rock formations, "Wonderland of Rocks", Chiricahua National Monument, Arizona. Pictured here are only a few of many grotesque and picturesque rock formations to be found in ...". Curteich, Chicago; #2B-H1534. Linen-texture, color, ca. 1940s. [On Academic Subject Specialties webpage]. "Green Mountain Inn & Motel, Stowe, VT. A gracious living room furnished with many antique pieces, is found in this old New England inn". Color Masters, Inc., New York, NY; #S-46955. Chrome-style, color, ca. early 1960s, hand dated 1964. [On Antiques & Collectibles webpage]. 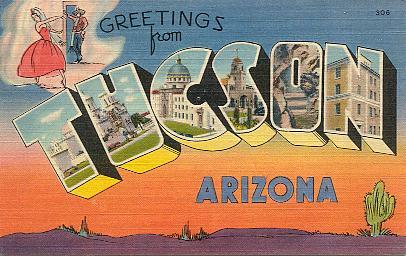 "Greetings from Tucson, Arizona". Published by Lollesgard Specialty Co., Tucson, Arizona. Printed by Curteich, Chicago; #8A-H808. Linen-texture, color, ca. 1940s. [On Arizona and Tucson webpage, bottom]. "Greetings from Arizona". [Map with 10 inset scenes]. Petley Studios, Phoenix; #8964G. Chrome-style, color, ca. 1950s. [On Arizona and Tucson webpage, top]. 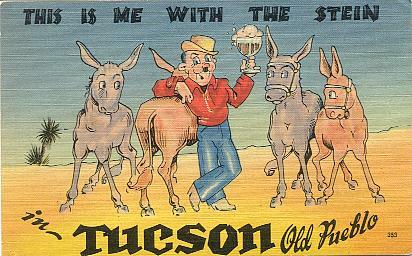 "This is me with the stein in Tucson, Old Pueblo". Published by Tucson News Agency. Printed by Tichnor Bros., Boston, Mass. ; #74613, #353. Linen-texture, color, ca. 1940s. [On Beer Resources webpage], bottom. "Ale-ale! the gangs all 'ere! - and all that's missin' is you!". Colourpicture, Cambridge, Mass. ; #604. Linen-texture, color, ca. 1940s. [On Beer Resources webpage], center. 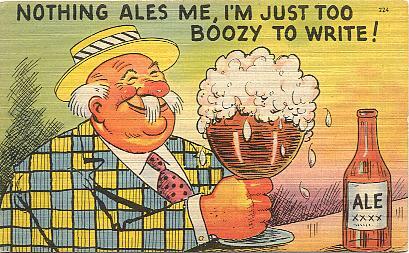 "Nothing ales me, I'm just too boozy to write!". Tichnor Bros., Boston, Mass. ; #69249, #224. Linen-texture, color, ca. 1940s. [On Beer Resources webpage], top. "Birdie, whisper to my dear, how my heart is beating. Say I wait a message here, place and time of meeting." SL & Co. Color printed, 1909 in written message. [On Birds webpage, bottom]. "Vermilion Flycatcher in Patagonia-Sonoita Creek Sanctuary, Arizona. 172 species of birds have been recorded at this rare stream bottom sanctuary in southern Arizona's Sonoran Desert. ... Arizona Chapter of the Nature Conservancy." Nature Conservancy, Western Regional Office, Los Angeles. Chrome-style, color, ca. 1960s. [On Birds webpage, top]. 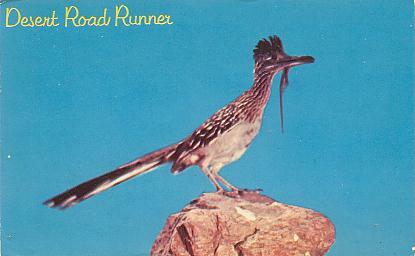 "The Desert Road Runner. About 22 inches in length, he would rather run than fly and sometimes reaches the speed of 18 miles per hour. ..." Petley Studios, Phoenix, Arizona; #4136-C. Chrome-style, color, ca. 1960s. [On Birds in My Yard in Tucson webpage]. "Carnegie Library, Phoenix, Ariz." Berryhill Co., Phoenix. Color printed, ca. 1900-10. [On Books webpage]. "In the Coconino Forest, Arizona". B. Houck, Flagstaff. Color printed, ca. 1910s. [On Treering webpage]. 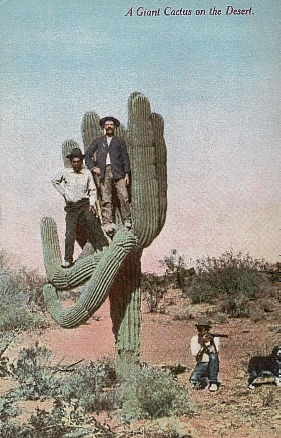 "Giant cacti; Saguaros--many are estimated to be 250 years old and weigh upto 14 tons, ...Found in the U. S. only in central and southern Arizona". Petley Studios, Phoenix; #6C-K3082. Chrome-style, color, ca. 1950s. [On Ecology & the Environment webpage]. "Wilmer E. & Anna O. (Poulson) Mount, of Trenton, NJ, and Pasadena, CA." [My grandparents]. Phillips, Atlantic City, NJ. Real photo, black & white, ca. 1915. [On Genealogy Resources webpage]. 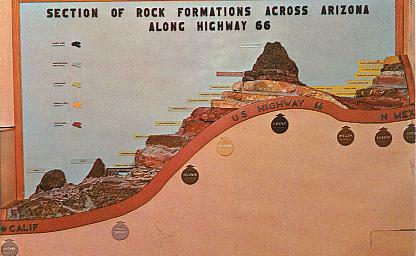 "Section of rock formations across Arizona along Highway 66. Museum of Northern Arizona.". Petley Studios, Phoenix; #90922. Chrome-style, color, ca. 1950s. [On Geosciences webpage]. 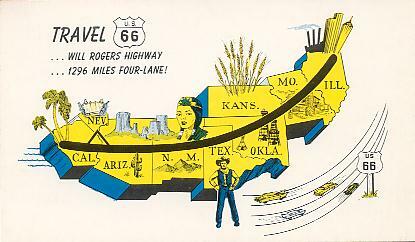 "Travel U.S. 66...Will Rogers Highway...1296 miles four-lane. U.S. 66 - highway where east and west meet. ...". Russell Stationery Company, Amarillo, Texas. Chrome-style, color, ca. 1950s. [On Highways and Roads webpage, bottom]. 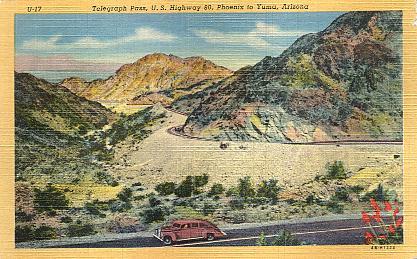 "Telegraph Pass, U.S. Highway 80, Phoenix to Yuma, Arizona". Curteich, Chicago; #4B-H1224, #U-17. Linen-texture, color, ca. late 1940s. [On Highways and Roads webpage, top]. "There is no place just like this place...". Bob Petley, Phoenix; #C-128. Chrome-style, color, 1957. [On Jack Mount's Home Place webpage]. "Library, University of New Mexico, Albuquerque. This beautiful building in the Pueblo Indian style of architecture ercted at a coast of $350,000 is the last word in modern convenience. Housing 62,000 volumes, space is provided for additional tiers as needed." 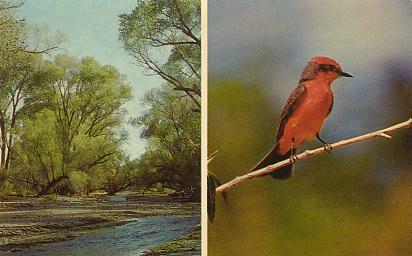 Distributed by J. R. Willis, Albuquerque. Printed by Curteich, Chicago; #8A-H710. Linen-texture, color, ca. 1940s. [On Libraries & Librarians webpage, top]. "Graduate School of Library Service, Rutgers University, New Brunswick, NJ". Bob Wyer Photo Cards, Delhi, NY; #67072-C. Chrome-style, color, ca. 1970s. [On Libraries & Librarians webpage, bottom]. "Looking west from 'Old Main', University of Arizona, Tucson. Library and College of Education on right". Lollesgard Specialty Co., Tucson; #66 63 and #L145. Chrome-style, color, ca. 1950s. [On Library Guides, Bibliographies & Indexes webpage]. 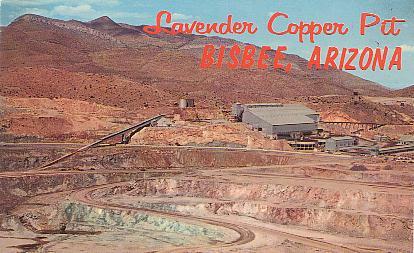 "Lavender Copper Pit & Mill, Bisbee-Lowell, AZ. Operated by Phelps-Dodge Corporation, this copper pit and mill are where once stood many homes and business buildings. Highway 80 had to be re-routed to make room for this operation". Petley Studios, Phoenix; #P20975. Chrome-style, color, ca. early 1960s. [On Mining & Mineral Resources webpage]. "Heard Museum, Phoenix, AZ. Herein, much of Arizona and the Southwest's colorful past history is preserved for future generations". Published by Jackson-Benton Sales Co., Phoenix. Printed by Colourpicture, Boston; #P3515. Chrome-style, color, ca. 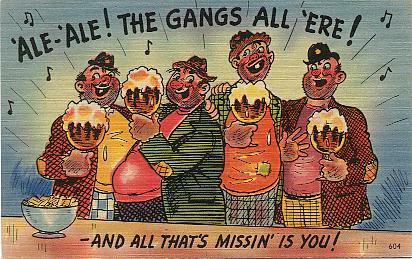 1950s, postmarked 1953. [On Museums webpage]. "Texas is a wonderful world! Cow Waddy O. K. Dunlap, owner of Grande Court, 720 N. Fillmore, Amarillo, Texas, offers you Texas hospitality from a boy who has spent forty years in the saddle! "Your home away from home." On U. S. Highways 60, 66, 87, and 287". Published by McCormick Co., Amarillo, Texas. Printed by Curteich, Chicago, Mass. Number 8B-H1145. 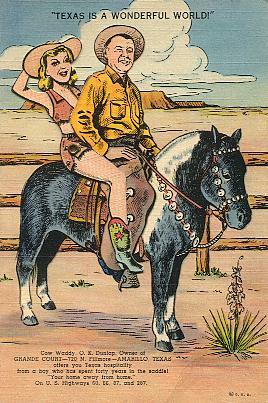 Linen-texture, color, mechanical (cowgirl rotates back and forth on the horse), ca. late 1940s. [On My Postcard Exhibits webpage, bottom]. 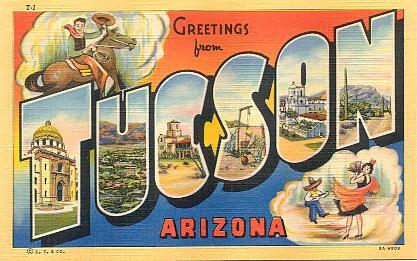 "Greetings from Tucson, Arizona". Published by Tucson News Agency. 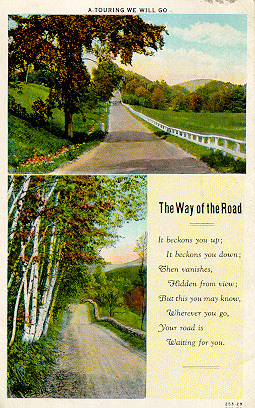 Printed by Tichnor Bros., Boston, Mass. Number 65318. Number 306. Linen-texture, color, postmarked 1943. [On My Postcard Exhibits webpage, top]. "In Sahuaro National Monument, Arizona. This cactus forest is located in the sheltered foothills of the Tanque Verde Mountains east of Tucson". Curteich, Chicago; #6A-H715. Linen-texture, color, ca. 1940s. [On National Parks webpage]. "Deposits of fossilized wood rich with agate, carnelian, jasper, topaz and onyx. Petrified Forest National Monument, Arizona." Frashers, Inc., Pomona, CA. Real photo, black & white, ca. 1940s. [On Paleontology and Fossils webpage]. "A giant cactus on the desert. On the road of a thousand wonders". 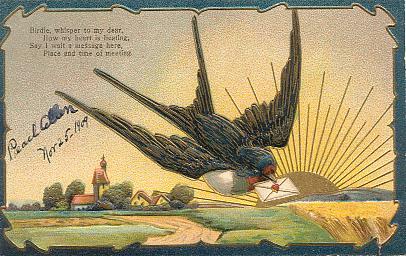 Newman Post Card Co., Los Angeles, CA; #AB136. Color printed, ca. 1910. [On Postcards Resources webpage, bottom]. "A Touring We Will Go. The Way of the Road: It beckons you up; It beckons you down; Then vanishes, Hidden from view; But this you may know, Wherever you go, Your road is Waiting for you". C. T. American Art, Chicago; #253-29. White border, color printed, postmarked 1915. [On Postcards Resources webpage, top]. "Horseshoe curves on west slope of Gold Roads grade - Oatman side on U.S. 66, Arizona". [View is between Oatman and Kingman]. Frashers, Inc., Pomona, CA. Real photo, black & white, ca. late 1930s. [On Route 66 webpage, top]. "Route 66, 'Main Street of America". [Map with 10 inset scenes]. Curteich, Chicago; #CK.46 & #4DK-1632. Chrome-style, color, ca. early 1960s. [On Route 66 webpage, bottom]. 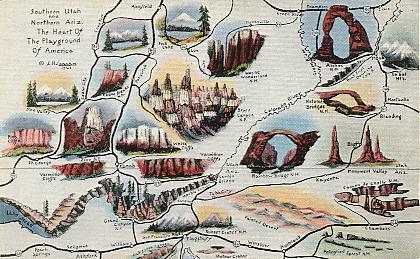 "Southern Utah and Northern Ariz. The heart of the playground of America". L. H. Larsen, Kanab, UT; #32033. Linen-texture, color, 1941. [On Science Maps webpage]. "Tombstone, AZ, was founded and named in 1879 by prospector Schieffelin who developed the first silver-gold property in this mining region. One of the West's real tough towns, it still looks today as it did in its hey-day". [Tombstone Epitaph Office]. Union Oil Co. Chrome-style, color, ca. 1940s. [On Some Useful Reference Pages webpage]. "Welcome marker [on Route 66] at the state line entering New Mexico...The Land of Enchantment". Baxter Lane Co., Amarillo, TX; #33113. Chrome-style, color, ca. 1950s. [On Travel Resources webpage]. "[Walkers on] Promenade, Willow Grove Park, Willow Grove, PA. The Park has numerous sheltered walks and promenades". J. M. Canfield publisher; printed in Saxony; #238876. 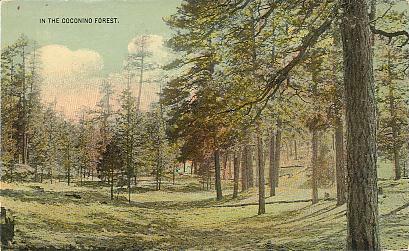 Color printed, 1908. [On Walking and Hiking webpage]. "University of California at Los Angeles. Covering 370 acres in Westwood is the beautiful campus of U.C.L.A. Here are seen the Library, the Physics Biology Building, and in the distance at the left the Administration Building". Mike Roberts Studios, Berkeley; #C1109. Chrome-style, color, ca. 1950s. [On Web Search Engines & Subject Catalogs webpage].